Lofexidine relieves symptoms such as aches, dizziness, and sweating that accompany opioid detoxification. Lofexidine is a selective alpha 2-adrenergic receptor agonist and was initially developed as a hypertension medication. "We know that the physical symptoms of opioid withdrawal can be one of the biggest barriers for patients seeking help and ultimately overcoming addiction," said FDA Commissioner Scott Gotlieb, M.D., in the agency's press release. "The fear of experiencing withdrawal symptoms often prevents those suffering from opioid addiction from seeking help. And those who seek assistance may relapse due to continued withdrawal symptoms." Adam Bisaga, M.D., a professor of psychiatry at Columbia University Irving Medical Center, told Psychiatric News that this approval is significant as it broadens the options for patients with opioid use disorder (OUD). Bisaga was not involved with the clinical studies of lofexidine that led to the FDA approval of the medication. "Right now, there are two very clear pathways to treat patients with opioid disorders," he said. "The first is to transition them onto a prescribed opioid medication like methadone or buprenorphine. The other is to detoxify them, and then prescribe naltrexone to prevent relapse." The naltrexone treatment plan has advantages since naltrexone is a non-opioid with limited abuse potential and clinicians do not need a waiver to prescribe it. Before naltrexone can be given to a patient, he or she needs to be completely free of opioids, or else withdrawal symptoms can be severe. It can take up to one week for opioids to clear from the body. Previously, to treat a patient's symptoms of opioid withdrawal, physicians were limited to prescribing clonidine (another hypertensive medication) off-label. Lofexidine now provides the benefits of clonidine in an approved formulation. 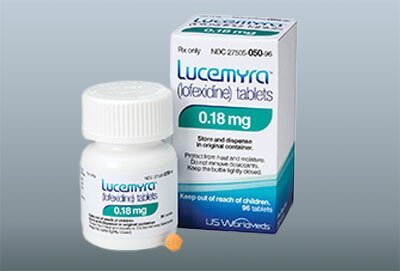 In addition, lofexidine is a more specific alpha-2 agonist than clonidine, noted Kyle Kampman, M.D., a professor of psychiatry at the University of Pennsylvania Perelman School of Medicine. "So lofexidine will have less propensity to lower blood pressure and heart rate at therapeutic doses," he said. "What often gets lost when talking about this approval is that people cannot disconnect detoxification from relapse therapy," Bisaga added. "Just helping someone detox is not considered a treatment for opioid dependence, especially in this day and age when opioids are so potent." Once a person clears their body of opioids, they have an increased risk of death if they ever begin taking opioids again because their body cannot tolerate opioids at the levels they used to take. The decision to approve lofexidine was based in part on the results of two randomized, double-blind, placebo-controlled clinical trials of 866 adults who met DSM-IV criteria for opioid dependence and were undergoing abrupt opioid discontinuation. The primary assessment was withdrawal symptom severity as measured by the patient-rated Short Opiate Withdrawal Scale of Gossop (SOWS-Gossop). This report consists of 10 questions that are scored using one of four response options (none, mild, moderate, and severe) to compile a symptom severity score ranging from 0 to 30. Other measures included a clinician-administered opiate withdrawal scale (COWS), as well as average time to dropout and number of patients who completed these one-week studies. In both studies, lofexidine significantly outperformed placebo on multiple assessments. After three days of treatment, participants in the lofexidine group had average SOWS-Gossop scores of 6 compared with 9 in the placebo group. In addition, the lofexidine group had about a 50 percent higher completion rate. Overall, the medication was generally well-tolerated, and most side effects that emerged were mild or moderate. The most common side effects reported by study participants on lofexidine included low blood pressure, slow heart rate, dizziness, fainting, and dry mouth. Given these side effects, the FDA stated that other agents that can lower pulse or blood pressure like alcohol or benzodiazepines should be used with caution by patients taking lofexidine.